Some people take time to reveal their true nature. Others give themselves away almost immediately, and Republic of Ireland underage footballer Kyle Conway definitely falls into the latter category. Some of what he reveals is exactly what one might expect, given his impressive sporting CV. As a central midfielder for the St. Patrick’s Athletic U-15 team — the side that won the National League and Cup in 2018 — his incredible athleticism is apparent at first glance. As club captain, it’s no surprise to hear him speak calmly and confidently, in a relaxed style that’s not always common in 25-year-old sporting stars, never mind one a decade younger still. However, it’s when the very first question is put to Kyle that he unveils where his real strength lies — in his family network and his wisdom to see the value of that support. Cindy and John Conway have come with their son for this interview and when the question is asked if they want to be part of the discussion or just to be there for him, Kyle immediately makes it clear how he feels things should proceed. “We’re all in this together, this has been a team effort all along,” replies the Coláiste Chiaráin student, and it doesn’t take long for the full story to unfold, illustrating exactly how true this is. How the three members of this Monksland family that still live at home have completely committed themselves to Kyle’s footballing career, to the point that he has earned international recognition and is now considering a number of options, including some clubs in England, for his next step. Four years ago, Conway played his football with the St. Joseph’s club in his native Monksland, but he recalls how the coaches identified his talent and suggested that a move up to Dublin might be the best option to develop his natural ability. “Derek Milton and Mickey O’Connor were the managers at St. Joseph’s,” he explains. “Mickey got in contact with Will Clarke from Dublin, from St. Joey’s boys. We went up for a trial, and that evening they came to Mam and Dad and said that they’d take me. “We were first planning on going up for the year, to see how it went. But we did the year. It went really well and we came to the decision that we were going to keep going at it, because it’s a good standard up there. If you want to go somewhere, you need that challenge. “In the second season I ended up moving to Crumlin United because they were looking for me for a long time and they had a link up with St. Pat’s. Then at U-15, the national league was kicking in. There were a few clubs asking about me, but we decided to go with St. Pat’s because of that link. We’d know more people there, and here I am now, still with them for my third year,” he outlines. The scale of the commitment becomes clear as John talks through what’s required on an average week. Training takes place on Tuesdays and Thursdays in Dublin, so he gets up at 5.30 a.m. in order to go in for an early shift at work, keeping him free to drive Kyle up the M6 later that day. Cindy joins the family for games at the weekend — and sometimes midweek — fixtures that might take place in Wexford, Derry, or anywhere in between. The question of why not move Athlone Town, to reduce the huge travel and time demand, is raised, but all three of them agree that the environment at St. Patrick’s Athletic has been ideal for Kyle, as evidenced by his selection as SSE Airtricity League U-15 Player of the Year for 2018. “You go to Pat’s and you see the winning mentality there,” states John. “The first season Kyle was there they won the Actavo Cup, where they beat Swansea, Aberdeen and other top teams. The league success, the cup, Ireland recognition, it’s all followed on. They’re constantly winning and that bond between the lads is developing so there is a bit of loyalty there. 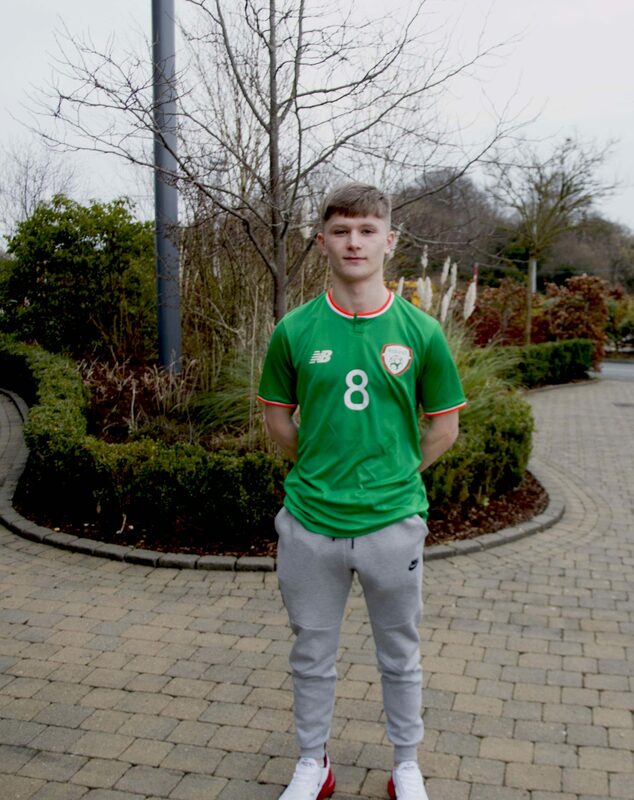 After a year in which his star has risen hugely, to the point that he was selected for the Republic of Ireland U-17 squad a few months ago, the young midfielder now feels that the time is right to make the move to England and to see how he fares at a higher level again. His immediate focus is still with lining out for the national side — last Thursday he was part of a Republic of Ireland U-16 squad that took on Germany in Spain. This week, they will play in Dublin against Australia. However once those games are played, the Conway family have some big decisions to make. “A few clubs are already interested but we just have to figure out which club is best and which offers is best. St. Pat’s are very much in the mix, but I think I’m at the age where you have to move to develop more and improve more. It would be a big step to go across the water but I think it would be worth it. As a promising student with a strong academic record in Coláiste Chiaráin, Cindy Conway wants to see Kyle maintain his studies, adding that aspects such as scholarships will be crucial to their decision-making process. But while she’s also concerned about who will step into her role as what Kyle describes with a grin as “logistics manager”, she also is clearly delighted to see her son with good options on the table, even if that means that he’ll have to move country. “You’ve got to consider where will his education be, what standard is it, will he be in a good position to get into a good third level college course if he ends up going that road?” she points out. “The money end of it is important of course, as is where he stays — is he going to be looked after well? I’m still his Mammy, that won’t change! “But we’re not after going up to Dublin for the last three and a half years for nothing. The whole aim here was to get him across to England to get a big opportunity,” she highlights. If Kyle is to make a real breakthrough and follow through on his undoubted potential, one unique aspect that is likely to give him a significant edge over his rivals is his incredible strength and power, which he attributes to one of his other sporting loves growing up — combat sports. “Coaches have come to us and said that Kyle is very strong, wondering where does he get that — other lads are banging off a brick wall out there,” notes Cindy. Kyle quickly explains exactly where it came from — his time working with Martin Ward in the Na Fianna Kickboxing Club in Athlone. “I’m only average height, other lads would be taller, so I’d have to have something that would stand to me. I hit the gym with Martin (Ward) on Mondays. I’ve done K1 from age six or seven in there. He’s effectively a personal trainer for me. I used to have competitive bouts, but I had to give it up, same as I used to play with Clann na nGael but I had to give that up as well. You just have to make your choices. “I did boxing, Thai boxing, I was a karate black belt from the age of eight, Brazilian jujitsu, so lads know not to cross me!,” he asserts with a grin. The smile on Kyle’s face talking about that side of his development makes it clear that he’d love to keep up his K1 interests, but his single-minded nature again comes through, and like so much else, this hobby has been sacrificed in order to give his football career every chance possible. For John and Cindy too, sacrifices have also been made. “Kyle’s sister Chloe is living and working in Manchester, and it would be incredibly difficult to take on what we’ve done if we had other kids at home,” admits Cindy, who took a career break to ensure that she could provide as much home support as possible over the past four years. John too freely admits that they’ve missed weddings and other occasions in order to make sure that they could support Kyle at every turn, but both parents would clearly make the same choices all over again, and just knowing that has made it easier for Kyle to make the choices he needs to make on a day-to-day basis. “They’re doing it with me, it’s not me on my own going up to Dublin. We’ve all made this the priority in our lives. There are sacrifices, like in the summer I don’t have a lot of time with my friends because I’m training, but Mam and Dad make those sacrifices every day too,” he says. “People ask me why do you do it, it’s hard going on all the family,” admits John. It’s an exciting question, and one where a lot will be revealed in the next year or so, for one of South Roscommon’s brightest sporting prospects.